Had I realised how tricky this was going to be I probably would not have committed myself to trees through the season which, inevitably, has to rely on photographs taken in previous years without a thought for this project. 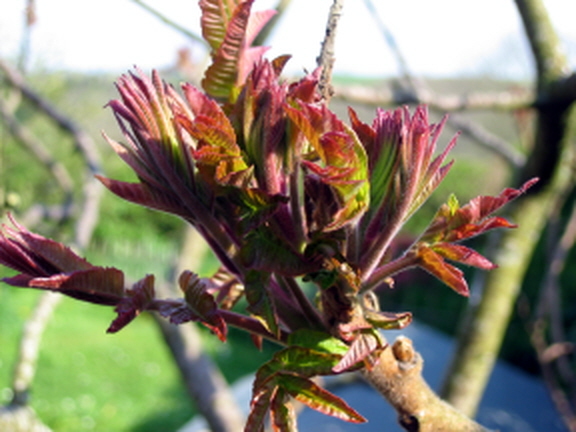 There should be lovely pictures of rufus red leaves breaking out opaque bud covers (simply because these have had no change to start the photosynthesis which produces the chlorophyll which then gives the leaves their green colour). The only picture I have that really shows this is of the sumac outside the kitchen door at The Hermitage and it is, therefore, a bit of a cheat. Now these are young beech leaves which, because their bud covers are translucent, leap into the world the most gorgeous delicate green imaginable. Had I known I was going to write this blog I would have taken a picture in a beech woods looking up into the canopy just as the buds burst open to reveal these lovely leaves. Where would spring trees be without flowers? 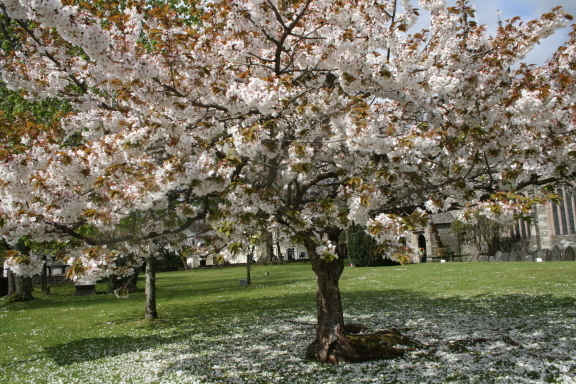 This cherry stands – with others – in the churchyard of St Eustachious in Tavistock but the glory is short lived. Already the ground is carpeted in petals and within a few days they will all have fallen. Blackthorn is a great delight: the flowers come out before the leaves but beware the long black thorns, the tips of which can break off so easily and are the very devil to prise out of the careless finger – thorns that will happily scoff at most gardening gloves. Here is a photograph I took many years ago. It was this old, snow-covered blackthorn growing by the O Brook where the road crosses Saddle Bridge on Dartmoor that gave Marcia the name for the bridge leading to The Grange in The Dipper. Sadly, the blackthorn has long since washed away. I must admit this is not a spring picture: it was definitely winter and Marcia looks suitably bundled up against the cold. Hawthorn – otherwise known as May – flowers after the leaves have appeared and somewhat later than the blackthorn. Does the old saying, “cast not a clout till May is out” refer to the hawthorn or to the month? The reason there are two pictures above is that Marcia and I couldn't decide which one to use so it seemed easiest to use both. Both are on Dartmoor – the one with the railings is at Venford Reservoir and the other on the open moor on Shapley Common. This close up of the hawthorn flowers gives you some idea of how quickly things change when they get going. Some of the flowers have yet to open and others, having done their job, have already lost their petals. 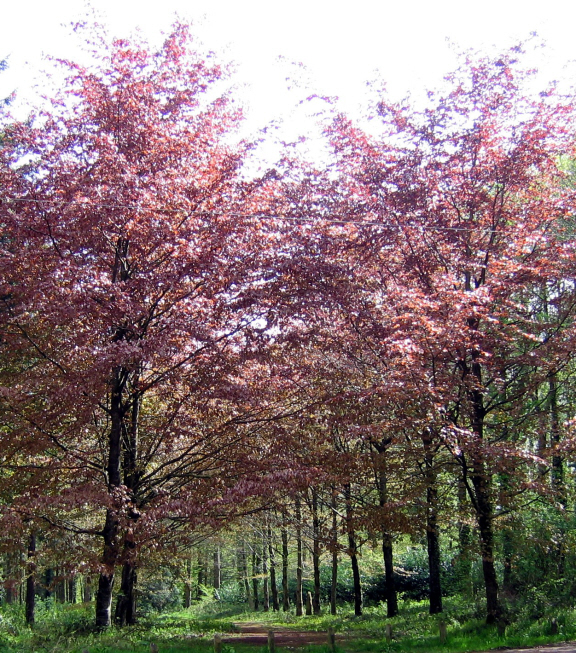 Before we leave trees I thought I would include this avenue of copper beeches. They go nowhere and I have no idea why they were planted there but quite pleased that they were. This weeks butterfly is a Silver-washed Fritillary Argynnis paphia. I forgot to give you the name last week: it was a Small Tortoiseshell Aglais urticae. I am only giving you the Latin names in case they are called something else where you live. In both cases I may have identified them incorrectly as this is noy an area in which I am at all expert. The Blog Dog of the week is called Amber.